Holbeach celebrate jack Smith's goal against Desborough. Photo: Tim Wilson. Stamford AFC are one win away from a place in the first round proper of the FA Cup. The Daniels sealed a thrilling last-gasp win at AFC Mansfield in the third qualifying round yesterday (October 1). They will now go into tomorrow’s (October 2) draw for the final qualifying round alongside the clubs from the National League. Action from Holbeach United v Dessborough. Photo: Tim Wilson. Stamford have never been in the same draw as the Football League clubs. Winning yesterday meant they equalled a 100-year-old club record for FA Cup progress. Oliver Brown-Hill was the man to keep his nerve for Stamford to convert a last-minute penalty awarded for a foul on Elliot Sandy. Ryan Robbins had equalised Mansfield’s first-half strike early in the second half. Both sides finished with 10 men. Jordan Smith was the Daniels man to be dismissed. Stamford will now revert to Evo Stik Division One South action and they won’t be enjoying seeing local rivals Spalding United sitting top of the league. Goalscorer Harley Williams on the ball for Peterborough Northern Star against Newport Pagnell. Photo: Tim Gates. The Tulips have put together a 10-game unbeaten run at the start of the season with seven wins and three draws, They took the lead through Brad Wells’ 11th goal of the campaign in the second-minute at Chasetown yesterday, but were hauled back five minutes into the second half before settling for a 1-1 draw. Spalding are two points clear at the top. Peterborough Sports are three points clear at the top of the United Counties Premier Division after strolling to another comfortable success against Leicester Nirvana at PSL yesterday. Jones brothers, Mark and Richard, scored two apiece in a 5-2 win. Dan Clements completed the city side’s scoring. There was a first defeat for Holbeach United who went down 2-1 at home to another title challenger Desborough despite taking a first-half lead through Jack Smith. The Tigers paid the price for failing to convert several other scoring chances. Chris Hassan wins a header for Peterborough Northern Star against Newport Pagnell. Photo: Tim Gates. Yaxley and Deeping Rangers are making stealthy progress in this division and both scored four goals in awayday successes yesterday. Dan Cotton scored twice and Liam Hook also netted before former Posh star Andrew Furnell claimed his second goal in two games in a 4-0 victory at Kirby Muxloe. The Cuckoos are now eighth, two places ahead of Deeping Rangers who made it three wins in a row as goals from Scott Mooney (2), Scott Coupland and David Burton-Jones secured a 4-1 win at ON Chencks. Harry Limb scored both Wisbech goals in a 2-2 draw at Wellingborough. 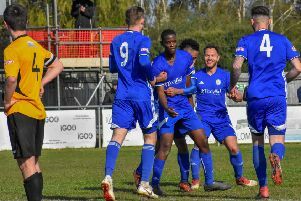 Peterborough Northern Star also drew, but they were just minutes away from claiming a notable success against high-flying Newport Pagnell at Chestnut Avenue. Harley Williams fired Star in front in the first-half, a lead they held until second-half added time when conceding from a free kick against a side who had been reduced to nine men. In Division One Bourne grabbed a win thanks to a solitary goal from Craig Rook against Rushden & Higham at the Abbey Lawns, but Blackstones were held to a 1-1 home draw by Lutterworth. Matt Simpson scored the goal for a team with just one win in 10 league matches. March Town United recorded a third win of the Eastern Counties Division One season by beating Cornard United 3-2 with goals from David Jackson, Rob Conyard and Max Matless. AFC Mansfield 1, Stamford 2 (Robbins, Brown-Hill). Chasetown 1 Spalding Utd 1 (Wells). Kirby Muxloe 0, Yaxley 4 (Cotton 2, Hook, Furnell). Wellingborough Town 2, Wisbech Town 2 (Limb 2). Bourne Town 1 (Rook), Rushden and Higham United 0. March Town 3, Cornard United 0. Wisbech St Mary 2 Braintree Town Res 0.